An OOTD for you today and despite the fact that it’s officially autumn now, the sun is still out in the city. On Sunday my boyfriend and I visited the Wellcome Gallery in North London for the Superhuman exhibition and spent the rest of the day awandering the city. It was my last chance to don a summery ensemble so I picked my favourite summer dress and had some fun with bright accessories. 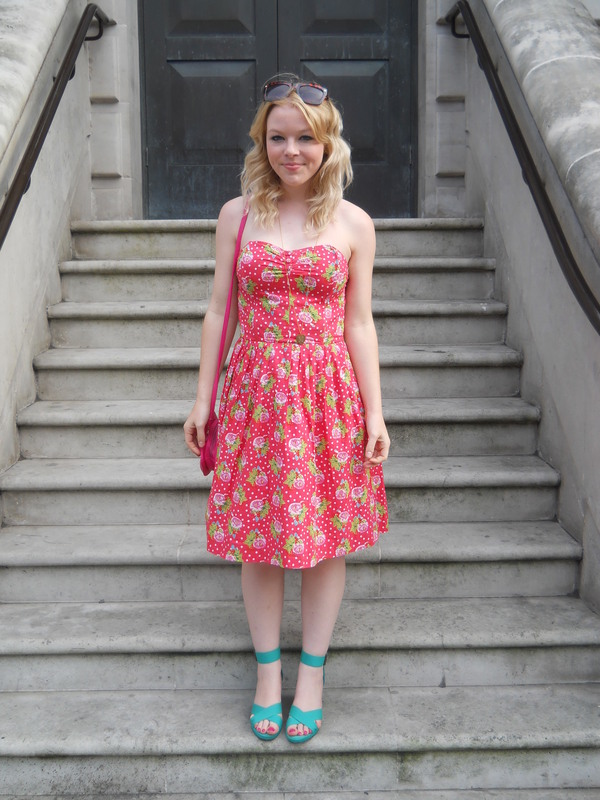 I’m wearing this cute floral and polka dot frock that I picked up a few years ago in TK Maxx. This is one staple dress that I wear to death come summer as it never really goes out of style and the classic shape means it’s always flattering. 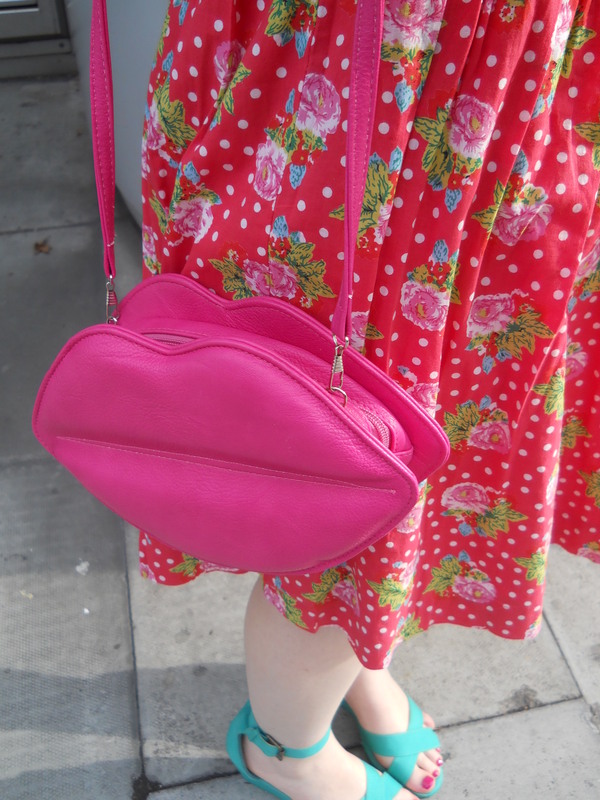 I teamed the bright dress with my pink lips clutch from Johnny Loves Rosie at ASOS. This gorgeous bag reminds me so much of the Lulu Guinness bags and can be worn as a clutch just like the originals too. I did a whole post on this bag a while back so I’ll link that here. Shoes-wise I opted for some H&M sandals that I also have treasured for many years as they’re super comfy and give you just enough height without being too dressy. The only piece of jewellery I wore was my faithful Urban Outfitters ‘M’ pendant which just adds a little more personality to the outfit without detracting from the print and statement bag. The sunglasses are H&M and are instore now and for those wondering my toes are painted with one of my all time favourite polishes Barry M’s Shocking Pink. Being as I’ve joined the world of instagram I thought I’d include my pictures from the ‘sunny Sunday’ below, you can find me on Instagram as camilladelacoe. 1. Finally finding the Katy Perry US Elle 2. 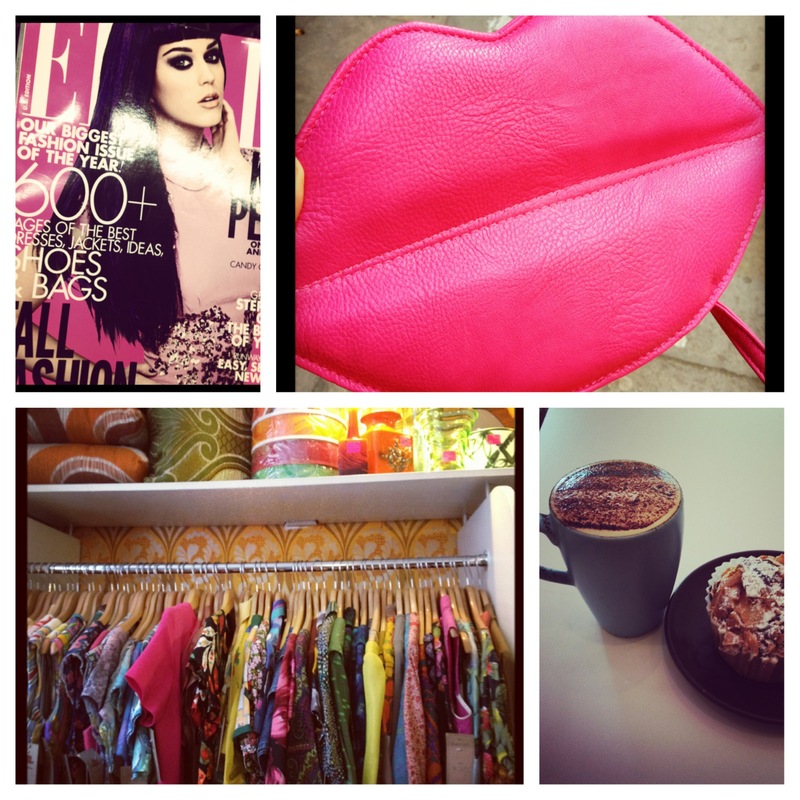 The Johnny Loves Rosie Lips Clutch 3. Vintage store Pop in Covent Garden 4. Cappuccino and a Coconut and Chocolate Muffin at the Wellcome Gallery Cafe. Disclaimer: All images were taken and are property of my boyfriend and I. All items were bought with my own money.